To pursue a better future for our world, we must first imagine it. And beyond just imagining a better future, we must create it here and now in a way that embodies and reflects our ideals and values. The newsroom operates as a powerful site of cultural production and a catalyst for socio-political change. Journalism has the capacity to shift public awareness and mobilize citizens to take action to address social problems. By imagining and then simulating a newsroom built upon new values and practices of journalism, we hope to demonstrate to other journalists, storytellers and mediamakers the potency of our central argument: diversity should be leveraged as a tool for civic engagement and as a catalyst for progressive change. We might not yet have the resources to build this newsroom, but we hope our efforts and sketches provide inspiration and encouragement to like-minded changemakers in the media world. To convey the possibilities and potential impact of our imagined newsroom, we’ve taken on an investigation about a single topic — women’s empowerment — through its natural lifecycle within the newsroom. 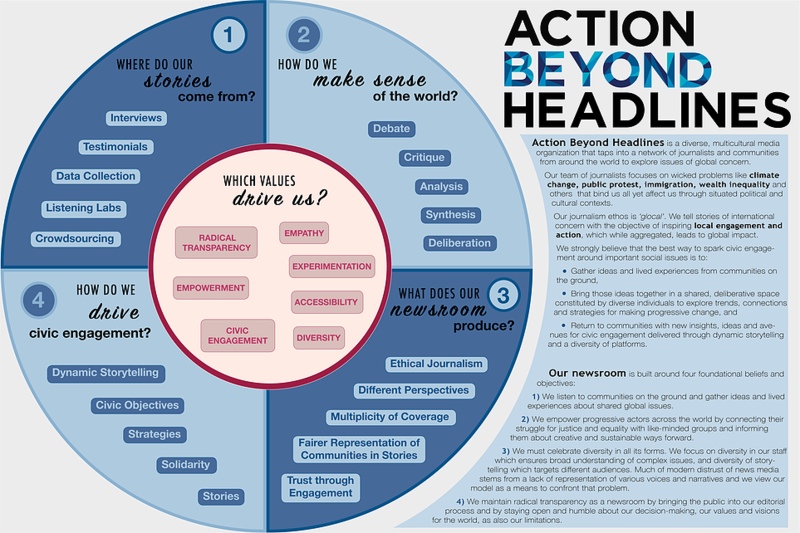 The journalism process begins by reaching out to the community and other stakeholders with reporting inside communities around the world; then the data and stories travel into the newsroom for analysis, synthesis and deliberation; and finally, the stories and ideas for civic engagement return to communities through dynamic storytelling platforms and in-person reflection. Help us imagine and build a better world. Visit Action Beyond Headlines by clicking here.